The idea of a "petroleum system" was introduced by Magoon (1988) for the setting of a prospect or play in the petroleum-geological sense. Older terms for the petroleum system were "habitat of oil model" (Nederlof, 1979). With Petroleum system estimation we refer first of all to the methods employed by the US Geological Survey. Such a method applies to a petroleum province, or a basin, in which the petroleum system is sufficiently uniform to make an intelligent guess about the prospectivity. The most common systems, such as from White & Gehman (1979) split the appraisal problem into two parts: (1) The chance of fulfillment and (2) Volumetrics. The elements that are involved in the above scheme should be independent from each other. Otherwise the multiplication of the probabilities would give a misleading final probability. What is also essential is that each ingredient in the list is a so-called "sine qua non", which means that when its probability is zero, the prospect/play is doomed, despite favourable other factors. For instance "no reservoir", but excellent sourcerock and maturity, etc, invalidates the prospect or play. Some schemes try to subdivide the above fulfillment factors (also called adequacy factors) in sub-factors. For instance reservoir involves presence of the formation, net-to-gross, porosity, water saturation. Here again, independence is required. The product of the sub probabilities is then the probability for reservoir. Basically, this procedure just expands the list of fulfillment factors. So, similarly, in the case of a stratigraphic trap, we might expand "Seal" into top seal, seat seal and lateral seal. Again if any of these fail, the prospect fails. The black numbers represent the "average probability" of the sub-factors on the left. If we consider the sub-factors as independent then the probabilities should be multiplied instead of averaged. The red figures in the probability column are obtained by multiplication and the correct ones in my view. It will be apparent that the overall POS of 0.36 is wildly wrong, because it should be 0.024! Why is this? Because if there is a puncture in a car tube,it does not help that other parts of the tube have no puncture... ; the averages state of the tube might be something like "0.01% punctured". That sounds like a woman saying "I am a bit pregnant". (Moreover, in this example there is some overlap between group of factors I and III with regard to timing, which means there is some dependence amongst the subfactors). It seems that the logic is flawed. 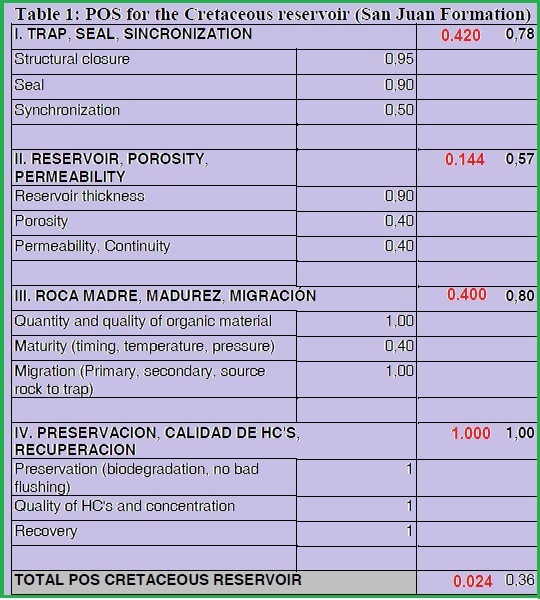 The same geological criteria are used in the Play and the Prospect assessment. Then the play factor probability is multiplied with the prospect factor probability to get a "final" factor probability for the prospect. This would only be allowed if the two probabilities are independent. If overlapping, it would invite double discounting. Or, at least it would be very difficult to keep these estimates for play and prospect independent in subjective probability estimation. By the way, if there is already one discovery made in the play, the play chance is 100% (of finding at least one accumulation). 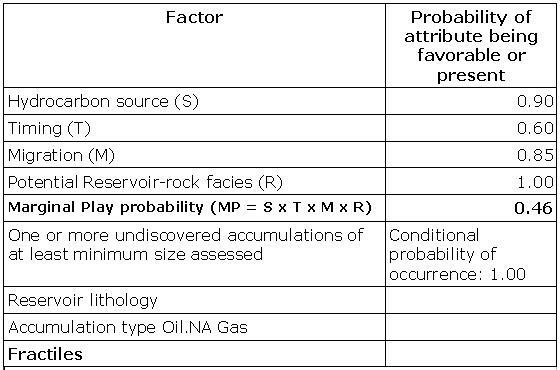 In that case the prospect factor probabilities are not changed by the play factor probability. I wonder what the significance of the play adequacy chance is. If we have knowledge of the geology for the prospects, it would seem that the individual estimates for a prospect would be all that would be required. The play chance would result from probabilistic addition of the individual prospect estimates, possibly taking any interdependence ("commonality") amongst prospects into account. It appears to me that this whole PP approach is an attempt to "do a pseudo bayesian". However, a true bayesian scheme with regard to the POS only is very demanding and therefore not as practical as the PP scheme. However it is interesting to see how the bayesian scheme compares to the above scheme. The salient point would be that the play probability would not be multiplied with prospect factor probability , but the play factor prior updated to a posterior factor probability, a process that is not at all the same as a multiplication. See also Calibration and the system described by Sluyk & Nederlof (1984). The calibration process provides the likelihoods required for the updating. The petroleum system overview with an event chart. This PP system of estimation is mostly applied to "assessment units", such as plays, in which, on the grounds of geological homogeneity, it can be assumed that field sizes form a single distribution. An important documentation that accompanies an assessment is the "event chart". 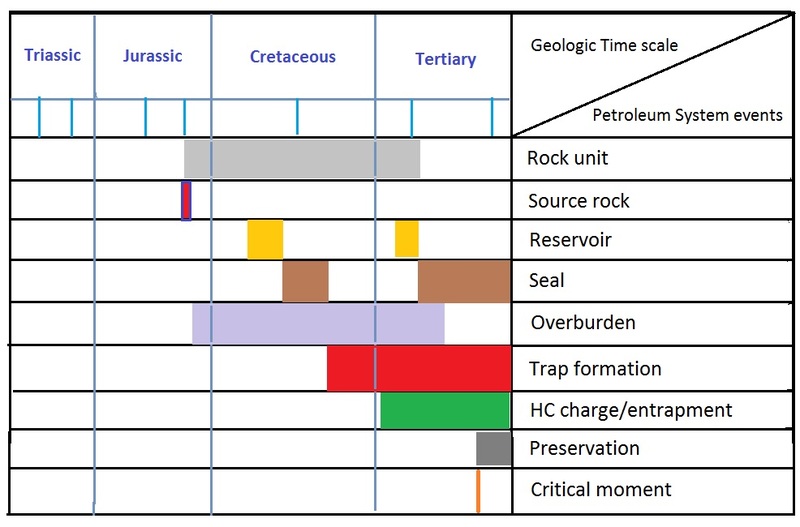 This shows the times of deposition of the essential rock units, trap formation, generation, migration and entrapment of the hydrocarbons and the preservation (Bishop, 2000). This term is used for a prospect appraisal process that first establishes the play characteristics and risks and then focusses on the prospects within the play. For the Play evaluation use is made of "Fairway Maps" which summarize the areal extent of the important factors, such as described above. The specific prospect POS is then reconciled with the play POS.